Does you child know how many dimes make a dollar? 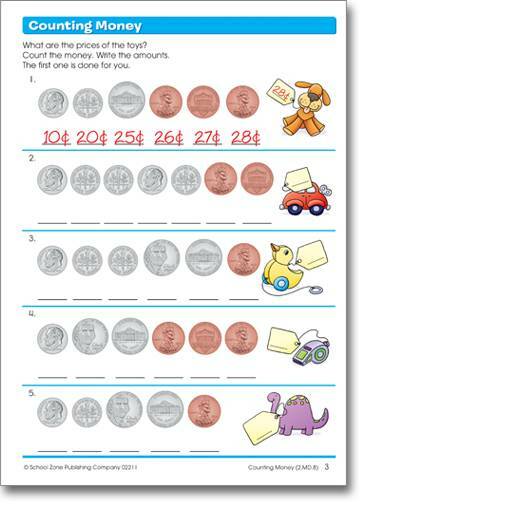 You can count on this workbook to cover coin values and other skills pertaining to money. You can also count on being surprised at how much your child will learn about time and fractions in this lively, skill-building workbook. 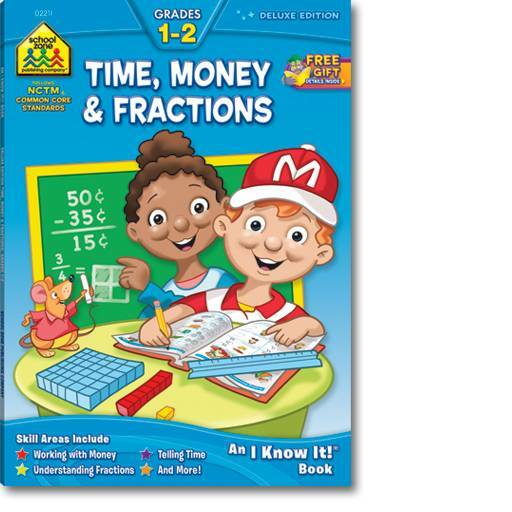 The skills typically taught in Grades 1 and 2 are right here: counting and comparing amounts of money to 99 cents, telling time by the hour, half hour, and quarter hour, plus identifying halves, thirds, and fourths of regions and groups and more. Features include an easy reference answer key, perforated pages great for individual worksheets, concept and skill focus listed at bottom corner of each page, parent guide and recommended activities pages and more. Reinforces the following skills: telling time; counting money; identifying equal parts; fractions.